Cuomo’s former closest aide, Joe Percoco, in March was convicted of bribery. On July 12, Alain Kaloyeros — the former president of SUNY Polytechnic Institute and the former architect of the governor’s biggest economic development deals, including the Buffalo Billion — was found guilty of bid-rigging. Groups on both the left and the right of the political spectrum say the problem with the state’s economic development deals go beyond the corruption cases. “It’s almost incidental. It’s a predictable result of a bad policy,” said E.J. McMahon with the Empire Center, a fiscally conservative budget watchdog group. 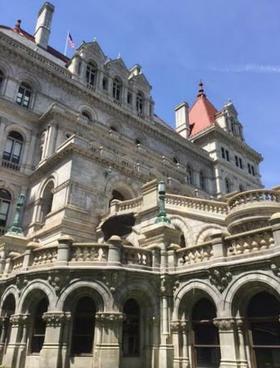 McMahon said during Cuomo’s tenure, the state has built, equipped and owned $1 billion worth of facilities, including the Solar City factory in Buffalo and a film industry hub near Syracuse. Solar City employs about 20 percent of the 3,000 employees initially projected. And the film center, which stood empty for years, was sold to Onondaga County for a dollar. But McMahon said even if they were successful, it’s the wrong business for the state to be in. McMahon said manufacturers already get tax breaks that are built into state law. He said the state’s resources are better spent on infrastructure, and New York should leave ventures that are more speculative to the corporations. Greg Biryla is with the New York chapter of the National Federation of Independent Businesses. He said the state has resorted to building factories and offering programs like Start-Up NY, which offers 10 years of tax subsidies to new companies, because the state’s business climate is so poor. Biryla said if taxes and regulations were significantly cut, businesses would have a better chance of growing. Ron Deutsch with the union-funded Fiscal Policy Institute agrees that the state should not be in the business of building factories for private businesses. He said if the “mega-deals” can’t be stopped, then the governor and Legislature should at least make them more transparent. He said they could create a public database that reveals which companies receive funding and the true costs of the projects. “The contracts and the negotiations and whatnot are shrouded in secrecy when you compare it to something like a nonprofit contract,” Deutsch said. He said nonprofits have to show far more documentation in exchange for state funding than did the business deals that led to the corruption convictions. Despite the corruption convictions, Cuomo continues to promote his economic development programs. Earlier this month, he announced $10 million in downtown revitalization grants for the Mohawk Valley city of Rome. Cuomo also continues to tout economic successes in Buffalo, saying that city has turned around. Jason Conwall is a spokesman for the Empire State Development agency, which now oversees the SUNY Polytechnic economic development projects as well as hundreds of other smaller efforts. He said in a statement that it’s “disheartening” that the negative “rhetoric” about the programs is too narrowly focused on a few big projects. And he accused critics of deliberately trying to “mislead” the public. Conwall said the Regional Economic Development Councils, which are led by local leaders, have 6,000 different projects that are already completed or on track for completion. And he said the state is spending big on infrastructure, with $12 billion committed or planned for projects, like upgrading many of the state’s airports and train stations.